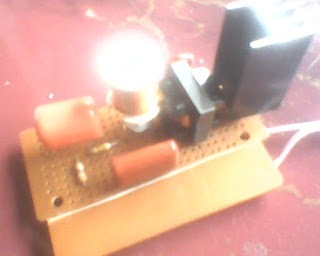 This High Voltage inverter, Inverter circuit on basic of really taking a series of mosquito racket, a racket in which these mosquitoes require only a low voltage. With only 3 Volts course of this series has been able to work. Circuit is raising the voltage by a transformer that can be made yourself with the need of copper wire and ferrite rods. How to making a transformer like that 12Volt Fuorescent lamp, but this circuit requires a step-up transformer that are larger and require a lot of coils. This transformer is controlled by a transistor semiconductor 24D506 in this series. To output issued until 1KV or more but issued is very low amperage. This circuit can also be used in fluorescent lamps 10W maximum. When used in fluorescent lamps add another capacitor to the voltage for provoke can turn on the lights. Did you just made your own.. transformer or bought it? How to decide AC frequency? Can we make it variable?